Corona, California. Green Lantern Print Shop, 1941. 42 pp. Harry Oliver, whose wit is ". . sharp as desert cactus . ." has compiled articles from his newspaper column Desert Briefs into an attractive booklet called 99 DAYS IN THE DESERT . . . WITH SANDY WALKER. History, travel, odd bits of information are written with dry humor, and seasoned with the fresh simple philosophy of an imaginary character, Sandy Walker, who probably is a rough characterization of the author himself. 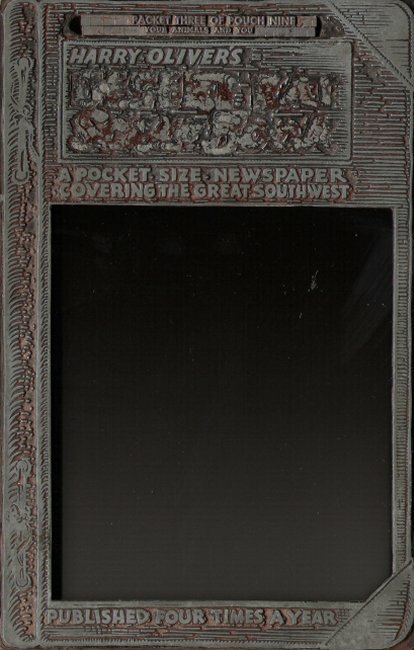 Attractively covered in brown art paper with hand block prints. 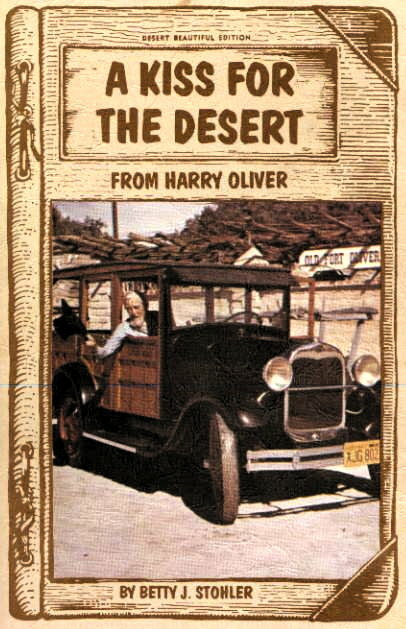 A KISS FOR THE DESERT FROM HARRY OLIVER (no ISBN) is the only 'bio-graph' of the Old Dream Merchant. Written enthusiastically, this book is a treasure trove of details about whatever bits of Harry's life he chose to disclose. 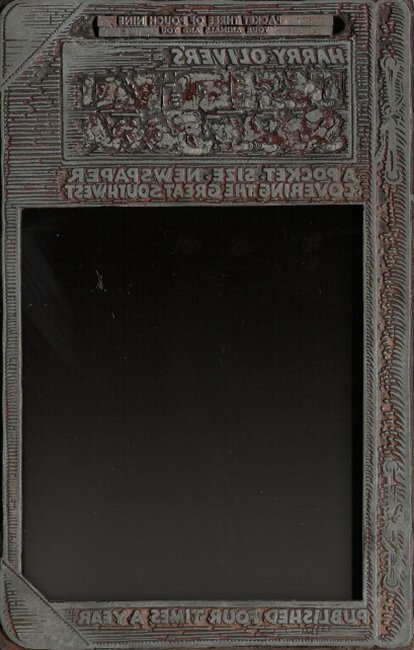 It is also lavishly illustrated, both with reprintings of Harry's work, and with Ms. Stohler's own illustrations. The sketches seem to be Ms. Stohler's renderings of old photos. For those interested in Harry's life and work, this book is highly recommended. Los Angeles, California. 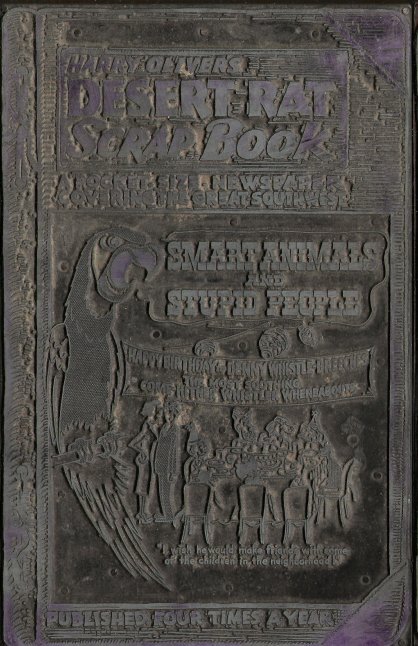 Ward Ritchie Press, 1938. 66 pp. 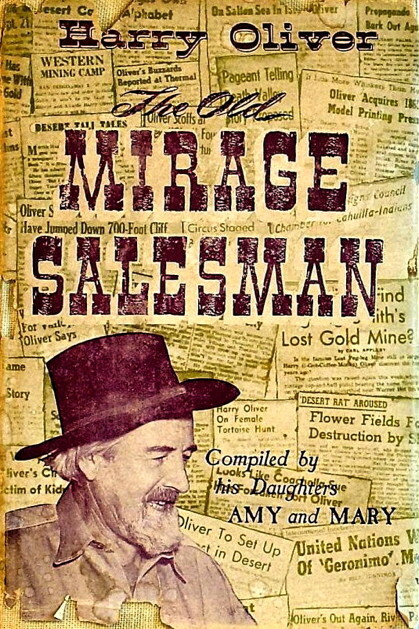 A true desert classic with all the excitement of lost mines, prospectors, and gold. 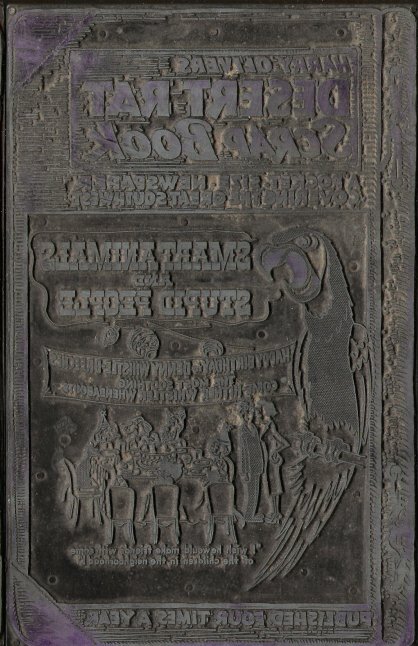 An artists delight as it is illustrated with woodcuts by the author. 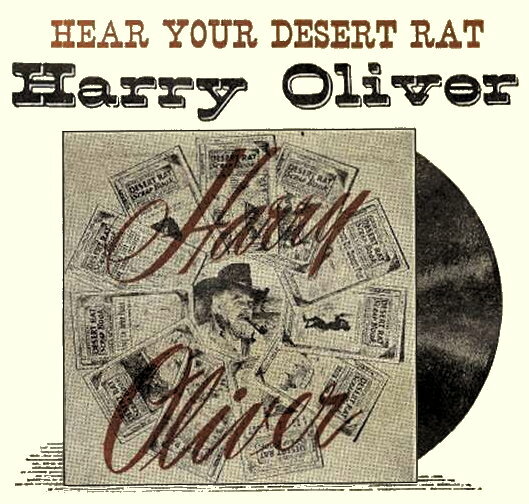 "Borrego's Hollywood connection were not all directors. . . . the best-known was Harry Oliver [1888-1973], an art director at Fox. 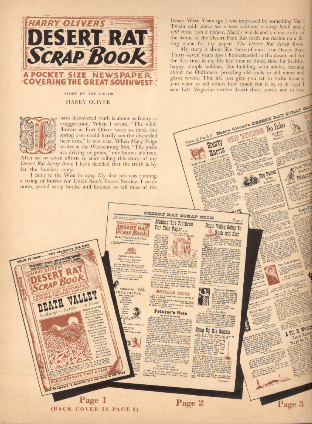 He became fascinated with the legends and lore of the Borrego Desert, and in 1938 published Desert Rough Cuts -- A Haywire History of the Borrego Valley, a fanciful piece that foreshadowed his famous Desert Rat Scrapbooks which began publication in 1946." 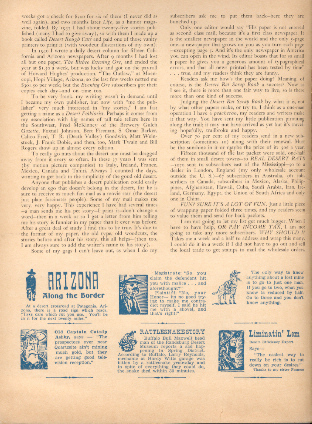 Harry wrote this interesting article, arrayed in a splendid four-page spread, for the March 1953 issue of ARIZONA HIGHWAYS magazine. To read Harry's ARIZONA HIGHWAYS piece, click HERE. 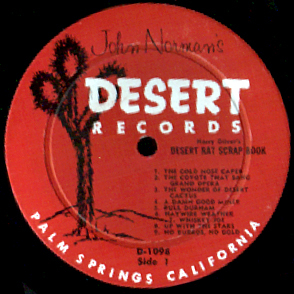 These plates were found at a local dumpground by Danny B. a few miles from 1000 Palms where Harry used to live. Pea Hicks has graciously contributed .MP3s and .JPGs of HEAR YOUR DESERT RAT HARRY OLIVER album of Harry reading a bunch of his yarns. CLICK ON A SELECTION BELOW TO HEAR IT! 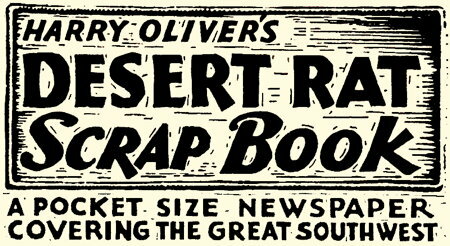 A book published in 1952 by Amy Fern Roessel and Mary Alice Ballenger, Harry Oliver's daughters, and dedicated "To the World's Greatest Optimist, The Desert Prospector." 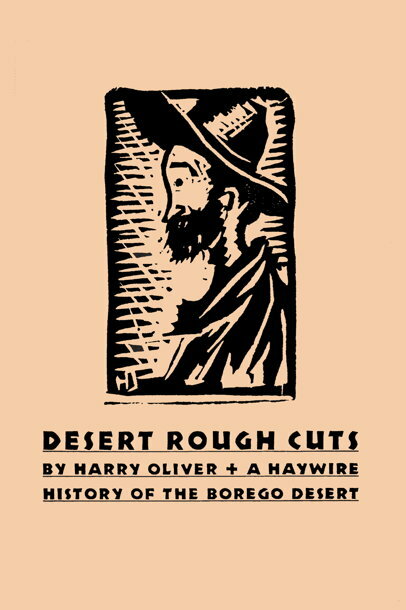 It is "A Whimsical Desert Digest of Refreshing Nonsense" — a compilation of Harry's works, lavishly sprinkled with his drawings and woodcuts. Amy and Mary wrote, "It has been a work of great pleasure to both of us. 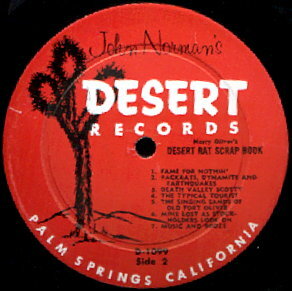 We lived with the creation of these characters during those happy years in the old home place in Palms, California (the last slice of La Ballona Rancho), and also on the porch of the rambling old HO Ranch, Dad's sprawling adobe in Borrego, and later at old adobe Fort Oliver, 1000 Palms, California. 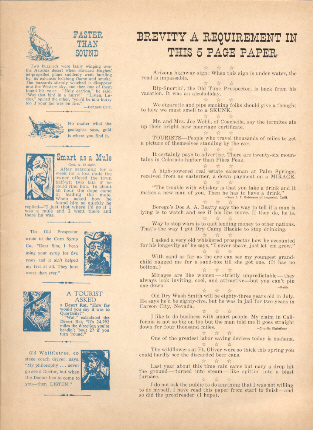 Many of the stories have been published as long ago as 1926 and '28. 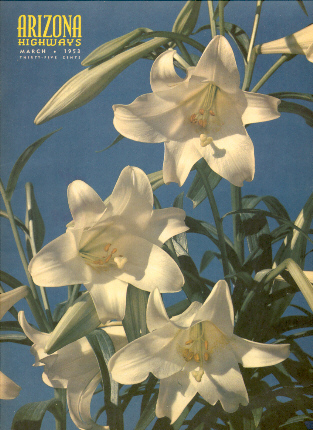 Six of them published in Life Magazine in 1932. 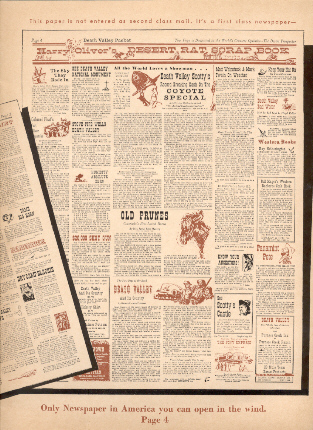 Others in "The Gold Miner," "Todo" — Mexico City, "the Grizzly Bear," Rob Wagner's "Script," "New Mexico Magazine," and "Calico Print." Now Dad was anything but a literary man, but we believe that for originality and choice of colorful props, no one could beat him. Each story has humor as well as a great deal of true Desert atmosphere. And he sure did know his Desert! We believe that this book belongs in every Desert library. Dad was born in Hastings, Minnesota, April 4, 1888. 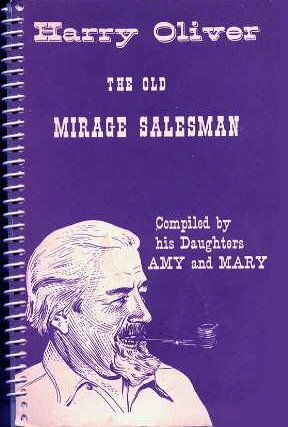 Dad's father was an ardent Mark Twain fan, and Dad grew up in a Tom Sawyer atmosphere. 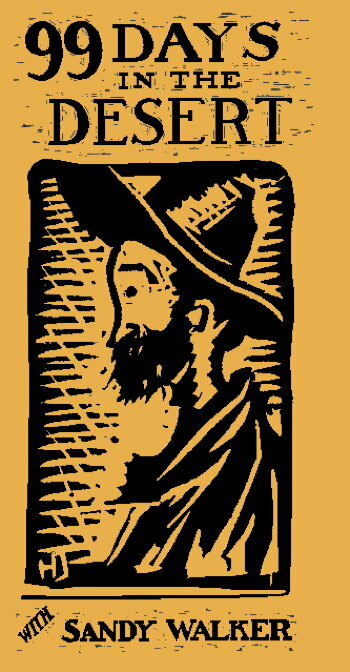 As a boy he knew, and mingled with the trappers, the steamboat men, and the woodsmen; the shack and shanty life became a vivid part of him. 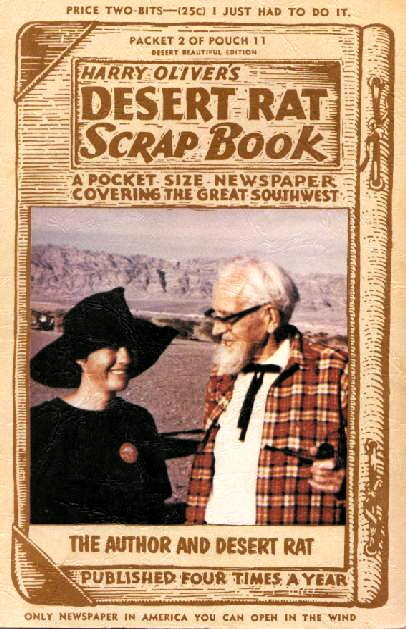 This cropped out in his career in motion pictures as a character art director and is the very soul of his desert tall tales — even though Dad didn't come to California till 1909."